Muhammad ibn Abd al-Wahhab (/wəˈhɑːb/; Arabic: محمد بن عبد الوهاب‎; 1703 – 22 June 1792) was a religious leader and theologian from Najd in central Arabia who founded the movement now called Wahhabism. Born to a family of jurists, Ibn 'Abd al-Wahhab's early education consisted of learning a fairly standard curriculum of orthodox jurisprudence according to the Hanbali school of law, which was the school of law most prevalent in his area of birth. Despite his initial rudimentary training in classical Sunni Muslim tradition, Ibn 'Abd al-Wahhab gradually became opposed to many of the most popular Sunni practices such as the visitation to and the veneration of the tombs of saints, which he felt amounted to heretical religious innovation or even idolatry. Despite his teachings being rejected and opposed by many of the most notable Sunni Muslim scholars of the period, including his own father and brother, Ibn 'Abd al-Wahhab charted a religio-political pact with Muhammad bin Saud to help him to establish the Emirate of Diriyah, the first Saudi state, and began a dynastic alliance and power-sharing arrangement between their families which continues to the present day in the Kingdom of Saudi Arabia. The Al ash-Sheikh, Saudi Arabia's leading religious family, are the descendants of Ibn ʿAbd al-Wahhab, and have historically led the ulama in the Saudi state, dominating the state's clerical institutions. Ibn 'Abd al-Wahhab is generally acknowledged to have been born in 1703 into the sedentary and impoverished Arab clan of Banu Tamim in 'Uyayna, a village in the Najd region of central Arabia. Before the emergence of Wahhabism there was a very limited history of Islamic education in the area. For this reason, Ibn 'Abd al-Wahhab had modest access to Islamic education during his youth. Despite this, the area had nevertheless produced several notable jurists of the Hanbali school of orthodox Sunni jurisprudence, which was the school of law most prominently practiced in the area. In fact, Ibn 'Abd-al-Wahhab's own family "had produced several doctors of the school," with his father, Sulaymān b. Muḥammad, having been the Hanbali jurisconsult of the Najd and his grandfather, ʿAbd al-Wahhāb, having been a judge of Hanbali law. Ibn 'Abd-al-Wahhab's early education consisted of learning the Quran by heart and studying a rudimentary level of Hanbali jurisprudence and theology as outlined in the works of Ibn Qudamah (d. 1223), one of the most influential medieval representatives of the Hanbali school whose works were regarded "as having great authority" in the Najd. As the veneration of saints and the belief in their ability to perform miracles by the grace of God had become one of the most omnipresent and established aspects of Sunni Muslim practice throughout the Islamic world, being an agreed upon tenet of the faith by the vast majority of the classical scholars, it was not long before Ibn 'Abd-al-Wahhab began to encounter the omnipresence of saint-veneration in his area as well; and it is probable that he chose to leave Najd and look elsewhere for studies in order to see if the honoring of saints was as popular in the neighboring places of the Muslim world. After leaving 'Uyayna, Ibn 'Abd al-Wahhab performed the Greater Pilgrimage in Mecca, where the scholars appear to have held opinions and espoused teachings that were unpalatable to him. After this, he went to Medina, the stay at which seems to have been "decisive in shaping the later direction of his thought." In Medina, he met a Hanbali theologian from Najd named ʿAbd Allāh b. Ibrāhīm al-Najdī, who had been a supporter of the neo-Hanbali works of Ibn Taymiyyah (d. 1328), the controversial medieval scholar whose teachings had been considered heterodox and misguided on a number of important points by the vast majority of Sunni Muslim scholars up to that point in history. Ibn 'Abd al-Wahhab's teacher Abdallah ibn Ibrahim ibn Sayf introduced the relatively young man to Mohammad Hayya Al-Sindhi in Medina who belonged to the Naqshbandi order (tariqa) of Sufism and recommended him as a student. Mohammad Ibn Abd-al-Wahhab and al-Sindhi became very close and Mohammad Ibn Abd-al-Wahhab stayed with him for some time. Muhammad Hayya also taught Mohammad Ibn ʿAbd-al-Wahhab to reject popular religious practices associated with walis and their tombs that resembles later Wahhabi teachings. After his return home, Ibn ʿAbd al-Wahhab began to attract followers, including the ruler of 'Uyayna, Uthman ibn Mu'ammar. With Ibn Mu'ammar, Ibn ʿAbd al-Wahhab came to an agreement to support Ibn Mu'ammar's political ambitions to expand his rule "over Najd and possibly beyond", in exchange for the ruler's support for Ibn ʿAbd al-Wahhab's religious teachings. Ibn ʿAbd al-Wahhab began to implement some of his ideas for reform. First, he persuaded Ibn Mu'ammar to help him level the grave of Zayd ibn al-Khattab, a companion of Muhammad, whose grave was revered by locals. Secondly, he ordered the cutting down of trees considered sacred by locals, cutting down "the most glorified of all of the trees" himself. Third, he organised the stoning of a woman who confessed to having committed adultery. These actions gained the attention of Sulaiman ibn Muhammad ibn Ghurayr of the tribe of Bani Khalid, the chief of Al-Hasa and Qatif, who held substantial influence in Najd. Ibn Ghurayr threatened Ibn Mu'ammar with denying him the ability to collect a land tax for some properties that Ibn Mu'ammar owned in Al-Hasa if he did not kill or drive away Ibn ʿAbd al-Wahhab. Consequently, Ibn Mu'ammar forced Ibn ʿAbd al-Wahhab to leave. This oasis is yours, do not fear your enemies. By the name of God, if all Nejd was summoned to throw you out, we will never agree to expel you. You are the settlement's chief and wise man. I want you to grant me an oath that you will perform jihad against the unbelievers. In return you will be imam, leader of the Muslim community and I will be leader in religious matters. The agreement was confirmed with a mutual oath of loyalty (bay'ah) in 1744. [better source needed] Ibn Abd al-Wahhab would be responsible for religious matters and Ibn Saud in charge of political and military issues. This agreement became a "mutual support pact"  and power-sharing arrangement between the Al Saud family, and the Al ash-Sheikh and followers of Ibn ʿAbd al-Wahhab, which has remained in place for nearly 300 years, providing the ideological impetus to Saudi expansion. The 1744 pact between Muhammad bin Saud and Muhammad ibn ʿAbd al-Wahhab marked the emergence of the first Saudi state, the Emirate of Diriyah. By offering the Al Saud a clearly defined religious mission, the alliance provided the ideological impetus to Saudi expansion. 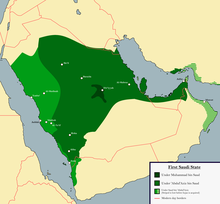 First conquering Najd, Saud's forces expanded the Salafi influence to most of the present-day territory of Saudi Arabia, eradicating various popular practices they viewed as akin to polytheism and propagating the doctrines of ʿAbd al-Wahhab. According to academic publications such as the Encyclopædia Britannica while in Baghdad, Ibn ʿAbd al-Wahhab married an affluent woman. When she died, he inherited her property and wealth. Muhammad ibn 'Abd Al-Wahhab had six sons; Hussain, Abdullah, Hassan, Ali and Ibrahim and Abdul-Aziz who died in his youth. All his surviving sons established religious schools close to their homes and taught the young students from Diriyah and other places. The descendants of Ibn ʿAbd al-Wahhab, the Al ash-Sheikh, have historically led the ulama in the Saudi state, dominating the state's religious institutions. Within Saudi Arabia, the family is held in prestige similar to the Saudi royal family, with whom they share power, and has included several religious scholars and officials. The arrangement between the two families is based on the Al Saud maintaining the Al ash-Sheikh's authority in religious matters and upholding and propagating Salafi doctrine. In return, the Al ash-Sheikh support the Al Saud's political authority thereby using its religious-moral authority to legitimise the royal family's rule. Ibn ʿAbd al-Wahhab considered his movement an effort to purify Islam by returning Muslims to what, he believed, were the original principles of that religion. He taught that the primary doctrine of Islam was the uniqueness and unity of God (Tawhid). He also denounced popular beliefs as polytheism (shirk), rejected much of the medieval law of the scholars (ulema) and called for a new interpretation of Islam. Traditionally, most Muslims throughout history have held the view that declaring the testimony of faith is sufficient in becoming a Muslim. Ibn 'Abd al-Wahhab did not agree with this. He held the view that an individual who believed that there could be intercessors with God was actually performing shirk. This was the major difference between him and his opponents and led him to declare Muslims outside of his group to be apostates (takfir) and idolators (mushrikin). Ibn 'Abd al-Wahhab's movement is today often known as Wahhabism, although many adherents see this as a derogatory term coined by his opponents, and prefer it to be known as the Salafi movement. Scholars point out that Salafism is a term applicable to several forms of puritanical Islam in various parts of the world, while Wahhabism refers to the specific Saudi school, which is seen as a more strict form of Salafism. According to Ahmad Moussalli, professor of political science at the American University of Beirut, "As a rule, all Wahhabis are Salafists, but not all Salafists are Wahhabis". Yet others say that while Wahhabism and Salafism originally were two different things, they became practically indistinguishable in the 1970s. At the end of his treatise, Al-Hadiyyah al-Suniyyah, Ibn ʿAbd al-Wahhab's son 'Abd Allah speaks positively on the practice of tazkiah (purification of the inner self). despite his at times vehement denunciations of other religious groups for their supposedly heretical beliefs, Ibn Abd al Wahhab never called for their destruction or death … he assumed that these people would be punished in the Afterlife …"
Historical accounts of Wahhab also state that, "Muhammad ibn ʿAbd al-Wahhab saw it as his mission to restore a more purer and original form of the faith of Islam. … Anyone who didn't adhere to this interpretation were considered polytheists worthy of death, including fellow Muslims (especially Shi'ite who venerate the family of Muhammad), Christians and others. He also advocated for a literalist interpretation of the Quran and its laws"
Despite his great aversion to venerating the saints after their earthly passing and seeking their intercession, it should nevertheless be noted that Ibn 'Abd-al-Wahhab did not deny the existence of saints as such; on the contrary, he acknowledged that "the miracles of saints (karāmāt al-awliyāʾ) are not to be denied, and their right guidance by God is acknowledged" when they acted properly during their life. Ibn ʿAbd al-Wahhab's teachings were criticized by a number of Islamic scholars during his life for disregarding Islamic history, monuments, traditions and the sanctity of Muslim life. One scholar named Ibn Muhammad compared Ibn 'Abd al-Wahhab with Musaylimah the liar alayhi la'na. He also accused Ibn 'Abd al-Wahhab of wrongly declaring the Muslims to be infidels based on a misguided reading of Qur'anic passages and Prophetic traditions and of wrongly declaring all scholars as infidels who did not agree with his "deviant innovation". The traditional Hanbali scholar Ibn Fayruz al-Tamimi (d. 1801/1802) publicly repudiated Ibn 'Abd al-Wahhab's teachings when he sent an envoy to him and referred to the Wahhabis as the "seditious Kharijites" of Najd. In response, the Wahhabis considered Ibn Fayruz an idolater (mushrik) and one of their worst enemies. According to the historian Ibn Humayd, Ibn 'Abd al-Wahhab's father criticized his son for his unwillingness to specialize in jurisprudence and disagreed with his doctrine and declared that he would be the cause of wickedness. Similarly his own brother, Suleyman ibn 'Abd al-Wahhab wrote one of the first treatises' refuting Wahhabi doctrine claiming he was ill-educated and intolerant, and classing Ibn ʿAbd al-Wahhab's views as fringe and fanatical. The Shafi'i mufti of Mecca, Ahmed ibn Zayni Dehlan, wrote an anti-Wahhabi treatise, the bulk of which consists of arguments and proof from the sunna to uphold the validity of practices the Wahhabis considered idolatrous: Visiting the tombs of Muhammad, seeking the intercession of saints, venerating Muhammad and obtaining the blessings of saints. He also accused Ibn 'Abd al-Wahhab of not adhering to the Hanbali school and that he was deficient in learning. A list of scholars with opposing views, along with names of their books and related information, was compiled by the Islamic scholar Muhammad Hisham. The state mosque of Qatar is named after him. The "Imam Muhammad ibn Abd al-Wahhab Mosque" was opened in 2011, with the Emir of Qatar presiding over the occasion. The mosque can hold a congregation of 30,000 people. There has been request from descendants of Ibn Abd al-Wahhab that the name of the mosque be changed. Despite Wahhabi destruction of many Islamic, non-Islamic, and historical sites associated with the first Muslims (the Prophet's family and companions), the Saudi government undertook a large-scale development of Muhammad ibn Abd al-Wahhab's domain, Diriyah, turning it into a major tourist attraction. Other features in the area include the Sheikh Muhammad bin Abdul Wahab Foundation which is planned to include a light and sound presentation located near the Mosque of Sheikh Mohammad bin Abdulwahab. There are two contemporary histories of Muhammed ibn ʿAbd al-Wahhab and his religious movement from the point of view of his supporters: Ibn Ghannam's Rawdhat al-Afkar wal-Afham or Tarikh Najd (History of Najd) and Ibn Bishr's Unwan al-Majd fi Tarikh Najd. Husain ibn Ghannam (d. 1811), an alim from al-Hasa was the only historian to have observed the beginnings of Ibn ʿAbd al-Wahhab's movement first-hand. His chronicle ends at the year 1797. Ibn Bishr's chronicle, which stops at the year 1854, was written a generation later than Ibn Ghannam's, but is considered valuable partly because Ibn Bishr was a native of Najd and because he adds many details to Ibn Ghannam's account. A third account, dating from around 1817 is Lam' al-Shihab, written by an anonymous Sunni author who respectfully disapproved of Ibn ʿAbd al-Wahhab's movement, regarding it as a bid'ah. It is also commonly cited because it is considered to be a relatively objective contemporary treatment of the subject. However, unlike Ibn Ghannam and Ibn Bishr, its author did not live in Najd and his work is believed to contain some apocryphal and legendary material with respect to the details of Ibn ʿAbd al-Wahhab's life. ^ a b c d e f g h i j k l m n Laoust, H., "Ibn Abd al-Wahhāb", in: Encyclopaedia of Islam, Second Edition, Edited by: P. Bearman, Th. Bianquis, C.E. Bosworth, E. van Donzel, W.P. Heinrichs. ^ Moosa, Ebrahim (6 April 2015). What Is a Madrasa?. UNC Press Books. p. 97. ISBN 9781469620145. ^ White, Jonathan R. (1 January 2016). Terrorism and Homeland Security. Cengage Learning. p. 252. ISBN 9781305886940. ^ Hubbard, Ben (10 July 2016). "A Saudi Morals Enforcer Called for a More Liberal Islam. Then the Death Threats Began". The New York Times. ISSN 0362-4331. Archived from the original on 15 December 2016. Retrieved 16 December 2016. ^ Asad, Talal (3 February 2003). Formations of the Secular: Christianity, Islam, Modernity. Stanford University Press. p. 222. ISBN 9780804747684. ^ ́goston, Ga ́bor A.; Masters, Bruce Alan (21 May 2010). Encyclopedia of the Ottoman Empire. Infobase Publishing. p. 260. ISBN 9781438110257. ^ Nawaf E. Obaid (September 1999). "The Power of Saudi Arabia's Islamic Leaders". Middle East Quarterly. VI (3): 51–58. Archived from the original on 6 August 2011. Retrieved 23 June 2011. ^ While there is some consensus over these details, the opinion is not unanimous over the specifics in regard to his place and date of birth. Seemingly his recognition with the Banu Tamim tribe thought is in line with the justification by some scholars of being the inheritor of the teachings of Ibn Taymiyyah. ^ a b c d Shahi, Afshin (4 December 2013). The Politics of Truth Management in Saudi Arabia. Routledge. p. 46. ISBN 9781134653195. ^ Al-Nasafī, Majmūʿat al-ḥawāshī al-bahiyya ʿalā sharḥ al-ʿaqāʾid al-nasafiyya, 4 vols. (Cairo: Dār al-Muṣṭafā, 2007), 1:194: "The miracles of saints are a reality (ḥaqq)." ^ Al-Ashʿarī, al-Ibāna ʿan uṣūl al-diyāna, ed. Fawqiyya Ḥusayn Maḥmūd (Cairo: Dār al-Anṣār, 1397/1977), 31, 33: "It is possible for God to single out the righteous (ṣāliḥīn) by making signs (āyāt) appear at their hands." ^ Al-Ṭaḥāwī, Matn al-ʿaqīda al-ṭaḥāwiyya, ed. Muḥammad Nāṣir al-Dīn al-Albānī (Beirut: al-Maktab al-Islāmī, 1398/1978), 59: "[W]e believe in what has come via sound transmission through trustworthy narrators (ṣaḥḥa ʿan al-thiqāt min ruwātihim) from among their [the saints'] miracles." ^ Al-Shaʿrānī, Laṭāʾif al-minan, 2 vols. (Cairo: al-Maṭbaʿa al-ʿĀmira, 1311/1894), 1:218: "Believing in the miracles of saints is a required truth (wājib ḥaqq)." ^ Al-Qushayrī, al-Risāla al-qushayriyya (Cairo: [al-Maṭbaʿa al-ʿĀmira], 1870), 186–7: "Believing in the possibility of the miracles of saints is an obligation." ^ Ibn Qudamah: "As for the people of the Sunna who follow the traditions and pursue the path of the righteous ancestors, no imperfection taints them, not does any disgrace occur to them. Among them are the learned who practise their knowledge, the saints and the righteous men, the God-fearing and pious, the pure and the good, those who have attained the state of sainthood and the performance of miracles, and those who worship in humility and exert themselves in the study of religious law. It is with their praise that books and registers are adorned. Their annals embellish the congregations and assemblies. Hearts become alive at the mention of their life histories, and happiness ensues from following their footsteps. They are supported by religion; and religion is by them endorsed. Of them the Quran speaks; and the Quran they themselves express. And they are a refuge to men when events afflict them: for kings, and others of lesser rank, seek their visits, regarding their supplications to God as a means of obtaining blessings, and asking them to intercede for them with God" (cited in Ahmet T. Karamustafa, Sufism: The Formative Period (Edinburgh: Edinburgh University Press, 2007), p. 132). ^ ʿAlī Hujwirī: "God has saints (awliyā) whom He has specially distinguished by His friendship and whom He has chosen to be the governors of His kingdom… He has made the saints governors of the universe… Through the blessing of their advent the rain falls from heaven, and through the purity of their lives the plants spring up from the earth, and through their spiritual influence the Muslims gain victories over the truth concealers" (cited in Radtke, B., Lory, P., Zarcone, Th., DeWeese, D., Gaborieau, M., F. M. Denny, Françoise Aubin, J. O. Hunwick and N. Mchugh, "Walī", in: Encyclopaedia of Islam, Second Edition, Edited by: P. Bearman, Th. Bianquis, C. E. Bosworth, E. van Donzel, W. P. Heinrichs). ^ Rapoport, Yossef; Ahmed, Shahab (1 January 2010). Ibn Taymiyya and His Times. Oxford University Press. p. 305. ^ Ibn Hajar al-Haythami: "Make sure you do not listen to what is in the books of Ibn Taymiyya and his student Ibn Qayyim al-Jawziyya and other such people who have taken their own whim as their God, and who have been led astray by God, and whose hearts and ears have been sealed, and whose eyes have been covered by Him... May God forsake the one who follows them, and purify the earth of their likes" (in Rapoport, Yossef; Ahmed, Shahab (1 January 2010). Ibn Taymiyya and His Times. Oxford University Press. p. 274. ^ Ibn Hajar al-Haythami: "Ibn Taymiyya is a servant whom God has forsaken, led astray, made blind and deaf, and degraded. Such is the explicit verdict of the leading scholars who have exposed the rottenness of his ways and the errors of his statements" (in Rapoport, Yossef; Ahmed, Shahab (1 January 2010). Ibn Taymiyya and His Times. Oxford University Press. p. 271. ^ Islamic Law and Society. E.J. Brill. 1 January 2006. p. 216. ^ Official sources on Ibn ʿAbd al-Wahhab's life put his visits to these cities in different chronological orders, and the full extent of such travels remains disputed among historians. As well, dates are missing in a great many cases, making it difficult to reconstruct a chronology of his life up until his return to 'Uyayna in 1740. ^ Parker T. Hart (1998). Saudi Arabia and the United States: Birth of a Security Partnership. Indiana University Press. p. 7. ISBN 0-253-33460-8. ^ Sebastian Maisel; John A. Shoup (February 2009). Saudi Arabia and the Gulf Arab States Today: An Encyclopedia of Life in the Arab States. Greenwood Press. p. 228. ISBN 978-0-313-34442-8. ^ Hunt Janin; André Kahlmeyer (22 February 2007). Islamic Law: The Sharia from Muhammad's Time to the Present. McFarland. p. 92. ISBN 978-1-4766-0881-5. ^ "Ibn Abd al-Wahhab". Encyclopædia Britannica Online. Archived from the original on 7 November 2016. Retrieved 12 December 2016. ^ "Allah". Encyclopædia Britannica Online. Archived from the original on 13 May 2008. Retrieved 28 May 2008. ^ Esposito, John L. (13 November 2003). Unholy War: Terror in the Name of Islam. Oxford University Press. ISBN 9780199840229. ^ Commins, David (2009). The Wahhabi Mission and Saudi Arabia. I.B.Tauris. p. 12. This brief essay is of tremendous significance for the Wahhabi mission and the subject of enduring controversy between supporters and detractors. It represents the core of Ibn ʿAbd al-Wahhab's teaching and the foundation of the Wahhabi canon. ^ Commins, David (20 February 2006). The Wahhabi Mission and Saudi Arabia. I.B.Tauris. pp. vii. ISBN 9781845110802. It is well known that Muslims profess belief in one God, and that such belief is a cardinal tenet of Islam. The profession of faith (shahada) states, 'There is no god but God, and Muhammad is the messenger of God.' The controversy between Ibn Abd al-Wahhab and his critics turns on the implication of the first clause and its sincere proclamation. Most Muslims throughout history have accepted the position that declaring this profession of faith makes one a Muslim. One might or might not regularly perform the other obligatory rituals – the five daily prayers, fasting, almsgiving, and pilgrimage – and one might or might not scrupulously conform to Islamic ethical and moral standards. But as long as one believed that God is one and that Muhammad is His messenger, then any shortcomings would render one a sinner, not an unbeliever. ^ Commins, David (20 February 2006). The Wahhabi Mission and Saudi Arabia. I.B.Tauris. pp. vii. ISBN 9781845110802. Muhammad ibn Abd al-Wahhab included in the category of such acts popular religious practices that made holy men into intercessors with God. That was the core of the controversy between him and his adversaries, including his own brother. ^ Commins, David (20 February 2006). The Wahhabi Mission and Saudi Arabia. I.B.Tauris. p. 23. ISBN 9781845110802. ^ "Wahabi & Salafi". Alahazrat.net. Archived from the original on 22 September 2012. Retrieved 17 September 2012. ^ Commins, David (2009). The Wahhabi Mission and Saudi Arabia. I.B.Tauris. p. ix. Thus, the mission's devotees contend that 'Wahhabism' is a misnomer for their efforts to revive correct Islamic belief and practice. Instead of the Wahhabi label, they prefer either salafi, one who follows the ways of the first Muslim ancestors (salaf), or muwahhid, one who professes God's unity. ^ Delong-Bas, Natana J. (2004). Wahhabi Islam. Oxford University Press. p. 4. ^ Moussalli, Ahmad (30 January 2009). Wahhabism, Salafism and Islamism: Who Is The Enemy? (PDF). A Conflicts Forum Monograph. p. 3. Archived (PDF) from the original on 23 June 2014. Retrieved 8 June 2014. ^ al-Makki, 'Abd al-Hafiz. "Shaykh Muhammad bin 'Abd al-Wahhab and Sufism". Deoband.org. Deoband.org. Archived from the original on 11 January 2015. Retrieved 3 April 2015. ^ Rida, Rashid (1925). Commentary of Shaykh 'Abd Allah bin Shaykh Muhammad bin 'Abd al-Wahhab al-Najdi's Al-Hadiyyah al-Suniyyah. Egypt: Al Manar Publishers. p. 50. ^ Gold, Dore (2003). Hatred's Kingdom (First ed.). Washington, DC: Regnery Publishing. p. 25. ^ DeLong-Bas, Natana J. (2004). Wahhabi Islam: From Revival and Reform to Global Jihad (First ed.). New York: Oxford University Press, USA. p. 61. ISBN 0-19-516991-3. ^ Peskes, Esther and Ende, W., "Wahhābiyya", in: Encyclopaedia of Islam, Second Edition, Edited by: P. Bearman, Th. Bianquis, C.E. Bosworth, E. van Donzel, W.P. Heinrichs. ^ a b c Mannah, Buṭrus Abū; Weismann, Itzchak; Zachs, Fruma (11 June 2005). Ottoman Reform and Muslim Regeneration. I.B.Tauris. p. 83. ISBN 9781850437574. ^ a b Mannah, Buṭrus Abū; Weismann, Itzchak; Zachs, Fruma (11 June 2005). Ottoman Reform and Muslim Regeneration. I.B.Tauris. p. 87. ISBN 9781850437574. ^ a b Mannah, Buṭrus Abū; Weismann, Itzchak; Zachs, Fruma (11 June 2005). Ottoman Reform and Muslim Regeneration. I.B.Tauris. p. 89. ISBN 9781850437574. ^ a b Mannah, Buṭrus Abū; Weismann, Itzchak; Zachs, Fruma (11 June 2005). Ottoman Reform and Muslim Regeneration. I.B.Tauris. p. 91. ISBN 9781850437574. ^ "Who was Mohammed ibn Abdul Wahab & what did he do? By Dr. Israr Ahmed". Youtube. Archived from the original on 17 March 2016. Retrieved 10 March 2015. ^ Qadhi, Dr. Yasir. "On Salafi Islam". Muslim Matters. Archived from the original on 16 February 2015. Retrieved 1 March 2015. ^ Zahawi (1994), pages 7-15. ^ "Imam Muhammad ibn Abdul Wahhab Mosque in Doha - Qatar". Beautiful Mosque. Archived from the original on 12 June 2015. Retrieved 19 June 2015. ^ "Qatar's state mosque opens to the public". Doha News. Doha News. 6 December 2011. Archived from the original on 19 June 2015. Retrieved 19 June 2015. ^ "Imam Muhammad ibn Abdul Wahhab Mosque in Doha - Qatar". Beautiful Mosque. Archived from the original on 2 August 2017. Retrieved 2 August 2017. ^ "Descendants of Saudi Wahhabism founder distance themselves from Qatar". Reuters. 29 May 2017. Archived from the original on 2 August 2017. Retrieved 2 August 2017. ^ Hubbard, Ben (31 May 2015). "Saudis Turn Birthplace of Wahhabism Ideology Into Tourist Spot". Archived from the original on 18 June 2016. Retrieved 27 May 2016 – via NYTimes.com. ^ Estimo Jr, Rodolfo (5 January 2017). "Diriyah on course to become world-class tourist spot". Arab News. Archived from the original on 19 October 2017. Retrieved 2 August 2017. ^ Humaidan, Muhammad (22 November 2011). "Diriyah — a symbol of Saudi heritage". Arab News. Archived from the original on 30 July 2018. Retrieved 2 August 2017. ^ "Mosque of Sheikh Mohammad bin Abdulwahab". Saudi Tour. Archived from the original on 2 August 2017. Retrieved 2 August 2017. Abualrub, Jalal (January 2003). Muhammad ibn Abdil Wahhab: his life-story and mission. Madinah Publishers and Distributors. ISBN 978-0-9703766-5-7. Retrieved 25 December 2011.
al-Rasheed, Madawi (1 January 2009). Kingdom without borders: Saudi political, religious and media frontiers. Capstone. ISBN 978-0-231-70068-9. This page was last edited on 13 April 2019, at 18:11 (UTC).